I chose this book as the Palliative Care Book of the Month because I have always had difficulty providing an evidence-based, logical and compassionate approach to patients with dementia. Hughes addresses these questions with an energy that seems contagious. His writing style is clear and his arguments include viewpoints that were new to me. What I particularly liked was his first person, hands-on approach – it was all very practical and down to earth. 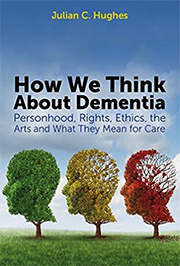 I think that anyone who works with people with dementia, or who has a special interest in dementia and dementia care, will appreciate this book. Julian Hughes is a consultant in Old Age Psychiatry for Northumbria Healthcare NHS Foundation Trust and Honorary Professor of Philosophy of Ageing at the Policy, Ethics and Life Sciences (PEALS) Research Centre at Newcastle University. 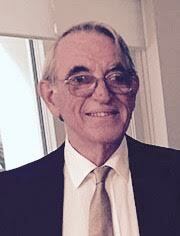 He read Philosophy, Politics and Economics at Oxford prior to studying medicine in Bristol. He then completed his higher training in psychiatry in Oxford and, at the same time, undertook a PhD in Philosophy at Warwick University. I found this book both informative and interesting. 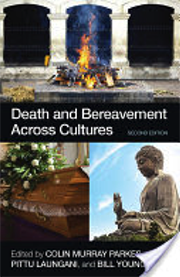 The idea of providing a useful summary of the practices of mourning and bereavement across the globe is no mean feat. The introductory chapters deal with how cultural and religious changes over recent times have modified practices. The second part provides a description of how death and dying are dealt with by the major world systems of belief and ritual – Hinduism, Buddhism, Judaism, Christianity, Islam and the secular. Having just watched the news from Brussels, I noted that the Qur’an is said to forbid not only euthanasia, but also honor killing, suicide terrorism and offensive (as distinct from defensive) action. The final part of the book is about practical implications for care, with an emphasis on what we might learn from others and how we might best care for persons of different cultural and religious backgrounds. This book should be of interest (and informative) to anyone who works in palliative care, and of particular interest to those with a special interest in dying and bereavement. 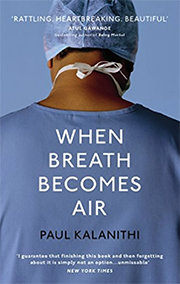 Just before Paul Kalanithi made it through advanced training to be a neurosurgeon, he had the great misfortune to develop metastatic lung cancer. This book catalogues his ascent up the residency ladder, with insightful descriptions of the many life and death situations he had been involved with, viewed from the perspective of someone who themselves has a terminal illness. It is very well written, as one might expect from somebody with degrees in English Literature and the History of Medicine. But I grew tired of the character portrayed, a self-obsessed pathological workaholic absolutely driven by professional ambition. In short, he was a bit of a pain. His wife, Lucy, barely rates a one-line mention early on in the book, and then is not mentioned until the time he has advanced disease and has to rely on her. But the last chapter, written by Lucy, is a redeeming breath of fresh air. Reflecting on Paul’s death and life, she describes a person, a nice person, even a funny, loving, caring person; not perfect, but a big improvement on the obsessed workaholic he describes. Given this book was written when he was dying, I shall attribute the imbalance to the pressure of time and uphold the adage that one should not speak ill of the dead. Anybody who works in palliative care should benefit from reading this well-written book, which provides insights into what living and dying are really about. I shall not reveal what I felt, as a younger man, about Fear of Flying in 1973. I missed Fear of Fifty. Now we have Fear of Dying. The heroine of this novel is Vanessa, a 60-year-old fabulously rich New Yorker. Through the course of the book, her aged parents die (so does her dog), and her much older husband requires emergency heart surgery. I had to admire her descriptions of the frailties and incapacities of her parents ­­– I almost felt I was there – and the reactions of various family members. The other half is her ruminations about growing older, some of which are right on the money; her descriptions of sexual experiences did nothing for me and seemingly did little for her. The chapter about the long-term effects of Jewish circumcision passed me by, but discussing it was obviously of benefit to the author. 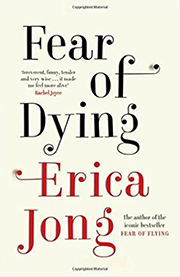 People reading this book will get a reasonably true picture of dying elderlies, what it means to be getting older, and what can (or can’t) be done about it.